Winter Weary. I read that somewhere lately and thought "how apt." Everyone is tired of wearing layers, tired of the cold, tired of the grey, tired of the snow (some more than others). Of the four seasons, winter seems to be the one that outstays his welcome. Still, spring will come. This I know without a doubt. It seems just a little bit closer when I notice that the forsythia branches I cut a week ago have blossomed into yellow on my mantel. This past weekend, the snow fell. I spent a couple of hours on a very grey Sunday afternoon playing with pencil, watercolour, and ink. Dreaming of more croci. Some in our area have had more snow. This morning I was called in to teach because a tree had fallen across a road, blocking a teacher's route to town. It was a day of scrambling since her power was out (no email or landline) and her cell phone coverage was down. All went well. I'll be teaching tomorrow and Thursday as well. Waiting for spring. Preparing to teach. Waiting today for news about a design competition. Our youngest flew to Montreal on Monday to take part in a design competition put on by Télio, a Canadian fabric company. Tonight is the final competition. 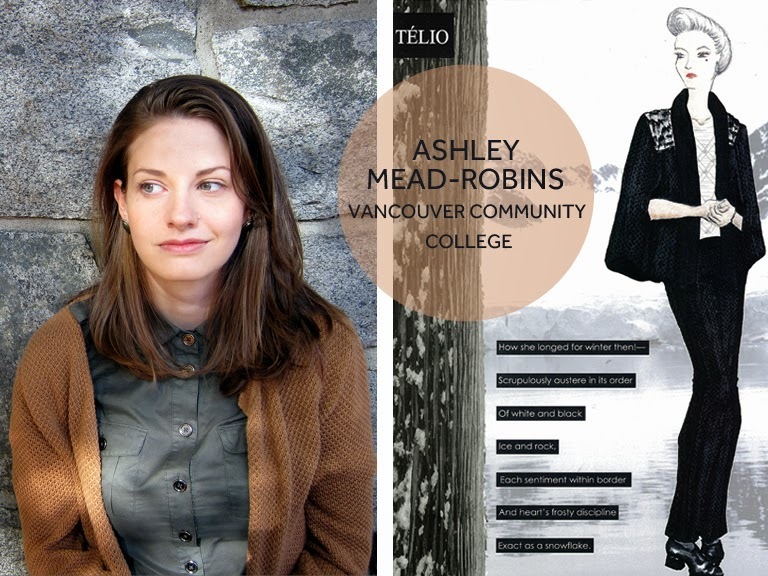 Whatever the outcome, Ashley has done well in being one of 25 finalists (out of 500 entrants). She'll make connections and have a wonderful time. We are so very proud of her. The link will take you to the Télio blog where there's a little writeup about each of the contestants. Are you waiting for anything in particular? Would winter-weary describe your state of mind? Congrats to Ashley on being a finalist. I enjoyed the link/write-up. Your art is very pretty, too. I saw my first glimpse of spring color just today. Best wishes with teaching the next two days. I just planted my forsythia last year so it is still too small to cut from . . . I look forward to doing that in years to come. Your art play is delightful! Congrats to Ashley Mead-Robbins . . . sounds like a very successful designer's name. How exciting! It must be so hard to wait for the results of this competition. I clicked the link and think her profile and design both look so professional. Best of luck Ashley! Your painting is lovely. Thank you for sharing it with us Lorri. Most special...that your daughter was chosen for the competition! Now I'm waiting along with you for the results. Good job...on your water colour art! Congrats to Ashley! I liked her design a lot. Wishing her all the best! Congrats to Ashley! That really is an accomplishment. I'm also very impressed with your artwork. Beautiful. We finally had a day today where I felt good about going out and trimming some bushes. How exciting for Ashley! Congrats to a proud momma as well! I am tired of the dreary weather as well,,,,,hoping some sunny weather is coming your way! Take care! Wow! What an accomplishment for your daughter! I'll have to go read about her now. I am waiting for the sunshine and the flowers, but I can't complain. We have had it so much easier than many places. Good luck to your daughter. How exciting for her. Love, love your painting of the croci's. I keep saying I will start painting and sketching again. Everything is sitting out hollering my name and yet I ignore. Yes, I'm very tired of winter! The temp is due to drop 25 degrees tomorrow.... not what I want! I'm off to read about Ashley! How exciting!!! Yes, I'm waiting for some news, just like you. Well done to Ashley what a talented pair you are. I do like your painting. Like mother, like daughter...both very accomplished! It's quite cold here, and as I mentioned on my blog, snows fall from Sept-May or even into June here. But I don't really get winter-weary. We have sunshine and bright blue skies most days, and I can bundle up and get out to walk even though the temps are low. We shovel a very long driveway - but even that feels like good exercise and a chance to enjoy being outdoors. Don't get me wrong ~ I am looking forward to spring. I just am still enjoying the wood fires, brisk walks, and quiet time to create. Best of luck to Ashley! I hope she has a wonderful time ~ there is so much creativity in your family! Lorrie, I feel so bad, I"m so behind here in blogland, and still deleting photos, seems like it's taken over my life. I love my back to top button too...and yes I knew that you and Cristal are related, you are both so very lovely, and kind, it was easy to put that one together. Congrats to your daughter in getting this far, I"m keeping my fingers crossed for her. Thanks for the reminder Lorrie, I should force some of my forsythia too! Take care and hopefully the snow will be gone soon! Winter-weary is exactly how I've been feeling. I'm enjoying seeing people's flower posts, so thank you for posting yours! Your croci are beautiful, by the way! The forsythia have not started budding here yet but they should soon. What a lovely spot of color they give to yes a "winter weary" world. - Your crocus painting is so pretty. Congrats to your daughter, I hope the completion goes well for her. I love that illustration -- from the lettering I can just see up its right side, I suspect you might have kept up the Illustrated Journal you started after Alison's class -- is this true? I finally got to mine again the other day after months and months and months away -- and (great minds thinking alike?) have a post ready to publish featuring my effort, ever so much less accomplished than your own. Oh, and congratulations on your daughter's success so far in this competition and best wishes in Montreal. What great exposure for her! That's great news about your daughter--I hope she does well. Obviously there's a lot of artistic talent in your family and your water colour is lovely! Way to go Ashley! Gosh, if you have those bushes blooming then you are way ahead of us with spring weather. I'm waiting for our first daffodil to open! I think this is the latest year in a long time for our first bloom.